As we head into the Holiday Season, we are thankful for God’s care and provision in spite of changes in our plans. We are still working with Mercy Ships, but living ashore in Liberia awaiting the finalization of Keyara’s visa. Many of you have questioned why Keyara’s paperwork is taking so long. It is not due to the Liberian Government, which finalized her adoption over a year ago. The delay is with U.S. Immigration. Before deciding to adopt we spoke with the U.S. Consulate, Acres of Hope Adoption Agency and several families who had already completed Liberian Adoptions. Two of these families had lived on the ship during the process and had no significant problems. We assumed our adoption would be no different. However, misinformation from the U.S. Embassy and other Adoption Officials caused us to file our I-600 Petition improperly. Our paperwork was in limbo for almost 6 months while we waited on clarification as to which office would process our petition. Finally, it was transferred to the San Jose USCIS Office. After multiple unsuccessful attempts at contacting this office and our assigned immigration officer we realized the importance of hiring an immigration attorney to get answers. We were also thankful for assistance from the offices of US Congressman, Peter Roskam and U.S. Senator, Diane Feinstein. In June, our attorney finally obtained a long list of information and tasks needed to complete our I-600 Petition. We have now provided all of these requirements, except one, and are awaiting clarification on that one point before we can move forward. As of mid-August housing was no longer available on board the Africa Mercy. The ship had been expecting our departure and had promised our cabin to another family. As a result, we have moved ashore to a two-bedroom guesthouse. It is located inside a walled compound with the main house being occupied by the Shank family. They are missionaries from Pennsylvania and have four boys and one girl. Since there is no kitchen in the guesthouse, we join them for the evening meal. Karen and Christina Shank share the teaching responsibilities of home-schooling Kaitlyn and their two oldest boys, Cameron and Darron, in second grade. Kaleb and Evon Shank are enjoying pre-school and learning to read, while Keyara and Faithe Shank have become like sisters. Although we do miss the many comforts of life on board the Africa Mercy, we are thankful for a safe, affordable place to live with friends for the kids and us. Kreig completed his work in the Information Technology Department on the ship by cleaning up some of the servers and data storage configurations. Additionally, he did an IT assessment of the University of Liberia Medical School’s Computer Lab. This will serve as the basis for a partnership between Loma Linda University in California and the University of Liberia, which is planning to upgrade its computer lab. Since moving ashore, Kreig has been working at the ELWA Mission Compound as an Advisor to the General Manager. (http://www.elwaministries.org). ELWA operates a radio station, hospital, dental clinic, school, power plant and infrastructure for a small community. They are in the midst of a management re-organization and in the process are restructuring their financial operations and accounting systems. Kreig has been working with the General Manager and the Comptroller to assist in the re-organization and consolidation of financial records and has felt great satisfaction in working off the ship with the resulting increased interaction with Liberians. Also at ELWA, Kreig has been able to assist Dr. Keith Chapman and Frieda Schmidt, RDH, our close friends from the ship. 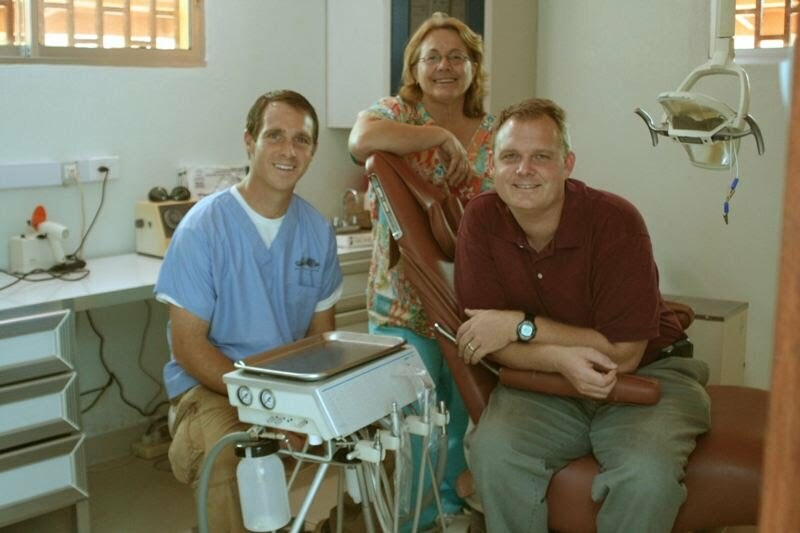 They have moved to Liberia to start Trinity Dental Clinic (http://www.trinitydental.org), which is located adjacent to the ELWA hospital. Trinity Dental is a joint venture between Mercy Ships and SIM. As there are only five dentists serving the entire population of Liberia (approximately 3 million people) there is a huge need for this type of clinic. Kreig’s responsibilities support the dental clinic by providing IT, Financial and Administrative consulting. It has been both rewarding and encouraging to see that in spite of the delay of our plans, Kreig’s skills and experience have been used to help these other ministries at a critical point in time. We are confident that God has orchestrated our time in Liberia so that Kreig would be available to help ELWA during their reorganization and Trinity Dental Clinic during its startup. In addition, our family has been able to invest in the lives of several Liberians at a much deeper level. For example, Karen is teaching Moses (30 years old) how to read. Because of the 14 year civil war, he was unable to attend school and consequently is at the same reading level as Kaleb. We are hopeful that Keyara’s visa will be issued sometime next spring. We’re expecting that we will be here in Liberia until May or June, at which time we plan to return to California. If, for some as of yet unforeseen reasons, we are unable to resolve the visa issue, we will have to wait until October, which will mark the two-year anniversary of Keyara’s adoption. At that point, the requirements for obtaining a visa will be much lower and it should be a straightforward process to apply and be granted a visa. We are truly grateful to so many of you who have faithfully supported us during the last eleven years. Without your support our work with Mercy Ships would not have been possible. It has been encouraging to reflect on how God has surprised us with His provision through so many different individuals over the years and we are confident that God will continue to meet our needs in ways that we can’t even imagine! This last year has not gone according to OUR plans, but we find ourselves clinging to the fact that God has a wonderful plan for our lives and He will not leave us in this time of uncertainty. Please pray with us that God will allow us to return to America in His timing and that during our time in Liberia we will not miss the many opportunities of service that lie before us. I would like to share with you what a blessing Kreig and Karen have been in the ministry of ELWA while they are waiting to finalize the adoption of their precious daughter Keyara. Let me explain. ELWA is a ministry committed to the gospel of Jesus Christ. E L W A are the call letters given to the radio station that was opened in Liberia over 50 years ago by a group of young missionaries. They were committed to reaching Liberia and eventually North Africa with the gospel of Jesus Christ through radio. The call letters stand for Eternal Love Winning Africa. For many years, the gospel was broadcast throughout Liberia and into other parts of the world. A hospital and school were added to the services provided. Sadly, in July of 1990, the radio was silenced because of the civil war taking place in Liberia. For fourteen years the country of Liberia was ravished by Civil war. The radio equipment and antennas were replaced several times by SIM, the mission operating ELWA. Eventually, it became too difficult to operate and SIM chose to withdraw from Liberia. There were, however, Liberians who did not want to see ELWA’s voice silenced forever. They approached SIM about the possibility of Liberians reopening and managing the ministry here. SIM agreed and ELWA was once again on the air, bringing the Good News to thousands during a time of intense conflict. Over time, they reopened the hospital and the school and continued to operate the Services Department which provides power, water, repairs and maintenance to the ELWA campus and equipment. Some, if not all of the leaders, stepped into positions for which they were not properly trained and as the years progress their need for mentors has become evident. I returned to Liberia in January of 2008 to act as the interim Deputy Director for SIM Liberia, which is now a partner with ELWA. As I spoke with the Liberian leaders of ELWA, I discussed the need for someone to help them set up their accounting systems and mentor them in their leadership skills. The day after we discussed the desire for someone to help them with their systems, I heard about Kreig and Karen and their need to remain in Liberia. I approached him to see if he could help us and based on his experience from Mercy Ships, he seemed like the perfect person to meet our needs here. To me this was a miracle that only God could bring about! To make a long story short, we cannot tell you how valuable their ministry has been to ELWA. Kreig has dedicated himself to working with the ELWA General Manager and the Comptroller to establish a centralized accounting system for the four departments. Centralizing the financial systems will allow ELWA to be better stewards of the resources which they have been given. This has been a huge undertaking and without Kreig’s help it would have been almost impossible for us to undertake. So, while we wish that they could return to the States, we want to share with you that while they remain in Liberia, they are being used of the Lord in a phenomenal way. I just praise the Lord for sending them to SIM.